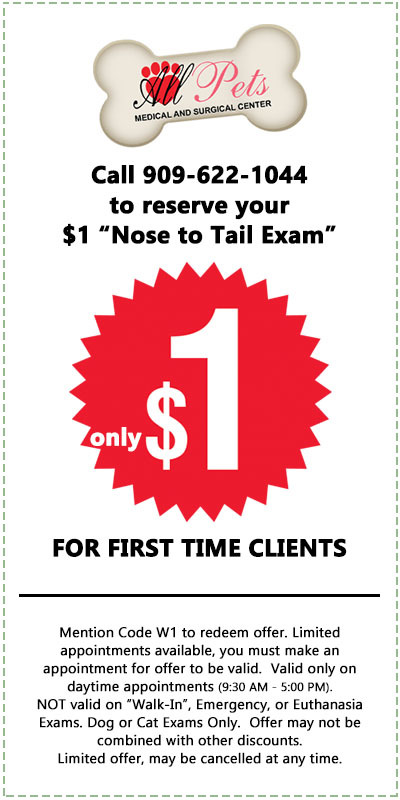 All Pets Medical & Surgical Center is offering a $1 "Nose to Tail" Veterinary Exam (a $56.00 value) for all new clients. Dr. Beighlie and Dr. Mintzer love helping animals so much, they want you to feel confident that they are the right team to take care of your beloved pet. Call 909-622-1044 today to schedule your $1 "Nose to Tail" Veterinary Exam, and meet the team at All Pets Medical & Surgical Center. Print this coupon, and mention code "W1" when you call to schedule your appointment.